Ticket King is located just southwest of Cathedral Square Park. 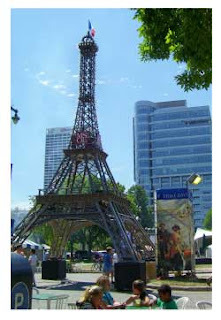 That's a good thing, becuase we are so close to Bastille Days 2012. It all started with the 5k run last night, and ends on Sunday night. In between that time, over 200,000 people will walk the streets of downtown Milwuakee, taking in the French and Cajun fun. Do you have a craving for French food? How about some solid cajun cooking? It's all here this weekend. The business crowd will surely take advantage of the lunch options, even if that means a trip out into the hot summer sun. The festival starts at 11am each day. For those of you who just love to shop, there will be retail vendors lining the streets. There will be music and live entertainment throughout the weekend. Check the Bastille Days website for specific info.